posted by Leslie Marino in Leadership, Public Speaking, networking, Self-Improvement, Personal Growth. posted by Will Barton in Batavia Middle School, Leadership, tanner kolb. Tanner Kolb is 12 years old, a sixth-grader at Batavia Middle School, and is officially an alumni of the Junior National Young Leaders Conference (JrNYLC). Tanner was nominated by her fifth-grade teacher, Mrs. Brown at John Kennedy School, to participate in the annual event held at our nation's capital, and made the journey Oct. 8 -13. Tuesday night, Tanner was excited to share her experiences. She said her favorite place she visited was Harper's Ferry, where she participated in a Civil War era battle reenactment. She met and made friends with students from not just across the continental 48 states, but places like New Zealand, Guam, Germany and Hawaii, and now has herself some pen pals. When asked what lessons she learned from her experience, Tanner told me "Anyone can be a leader, if they're willing to work for it. Leaders are not born that way, they have to work for it." I asked what message she would like to send to other students who might be able to earn a nomination to participate. Her response was simply, "I'd tell them go for it. Definitely go for it." She was written a thank-you letter to all her supporters, whose fundraisers made the trip possible. Afterall, going to D.C. can be pricey. "I would like to personally thank everyone who donated pop cans, bought something from one of my fundraisers, or donated money to help me go on my trip to Washington, D.C. I had tons of fun and went to lots of interesting places. I went to Harper's Ferry, an old Civil War town where we reenacted a battle. We went to lots of memorials, like the Lincoln, the Martin Luther King Jr., the Korean War, the Vietnam War, and many other places such as the Capitol building, the White House, and the Museum of American History. We ate at the Hard Rock Cafe, and Buca di Beppo restaurant. I made lots of new friends from all around the world and I still talk to them a lot. We also had a sleepover at the Maryland Science Center! I would like to say a special thank you to my fifth-grade teacher, Mrs. Brown, who nominated me for this trip. It really means a lot to me that she believed in me that much. I loved this trip and it would not have been possible without your help. posted by Patrick Olson in communication, Leadership. A Toastmasters meeting is a learn-by-doing workshop in which participants develop their speaking and leadership skills in a friendly atmosphere. Learn communication and leadership skills in a relaxed and enjoyable environment. Attend a free meeting to see how this program can benefit you. The next meetings will be at 1 Mill Street, Batavia, NY 14020. May 10th and May 24th 2011. P is for People: What’s in a Thank you? posted by Session Placeholder in business, Blogs, Leadership, The World: By Phil. Do you remember when you were a kid? Every time that someone gave you a piece of candy at the store, or a cookie at a neighbor’s house, your parents would always chime in with, “What do you say?” Flash forward however many years later (No, ladies I am not asking any ages, my mama taught me better than that!) Now as an adult you find yourself running around like crazy for work, home and whatever else that you do trying to accomplish a million different tasks. Well that sounds about right for most of us on this crazy roller coaster of life, but let’s take it from another angle. How many of those times that you wore yourself out for someone else, did that person actually stop to thank you for those efforts? We have all been taught from an early age to do that very thing. “Say thank you, young man” my mom would say, or my personal favorite and one that I have past on to my kids, “We can be many things in life, but we may never be rude!” All really great important lessons, but for some reason as I grew up and entered the work force, I realized that these lessons didn’t seem to apply to those in leadership positions. For whatever the reason, there was just never enough time to stop and say thank you. Kind of rude, huh? That’s what I thought! One of the biggest complaints in most companies that employers receive from their staff is the sheer lack of recognition and appreciation they receive. People love to be noticed for their efforts. That’s simple and it makes sense too doesn’t it? If you are working hard and just killing it for your company, or even just taking on more responsibility, you want someone to look at those efforts and say, “Gosh they’re great and so are you!” or something less corny like it. If you’re a freelancer, you may or may not care as much, but it still feels good when your clients are grateful for your efforts and show it, right? So why is this such a problem? In a couple of recent Gallup polls, 43.5% of Americans say that they are dissatisfied with their direct line supervisor. The main reason? Lack of respect and appreciation. The part that truly boggles me is the disdain that a lot of leaders have for this topic when it is brought up. This seems to have always been the case, but the current financial slow down has only escalated the effects. More so, over the past decade the United States has shown that is not as workplace family-oriented as many other wealthy countries. According to a study released by Harvard and McGill University researchers in February 2007, workplace policies for families in the U.S. are weaker than those of all high-income countries and even many middle-and low-income countries. The whole “Just be happy you have a job!” philosophy has become the standard in the minds of a lot of leaders. So what can you do? Well first off, if you are a leader of people reading this, regardless of the size of your team, ask yourself a simple question; Do I thank my employees? If the answer is yes, then I say great job. Keep it up! If the answer is no, then all I ask is this; Why? What is the reason that prevents you from doing it? As I was coming up in my career, I have had the pleasure of experiencing all different types of leadership and management styles to work for. Some of the nicest people were the worst when it came to their professional duties and vice versa. For example, I had one boss who I became very good friends with as I moved up. He was one of the sweetest and kindest individuals that I had ever met. Yet he would never thank his employees for anything. I brought this up to him after I no longer reported to him and he told me point blank, “I pay them, that’s thanks enough.” Ouch. Another example would be back in my retail days. I had literally one the worst leaders on the planet. The man had no right to be in the position he was in. He was unorganized, rude and had absolutely no business sense or vision. Yet, when he was dealing with his teams, he would thank them religiously and often. If he saw you killing yourself, he would tell you to take a break and buy you a coffee. Even though I couldn’t stand the man as a boss, I found myself staying late to help him with his paperwork so he wouldn’t get in trouble. Showing your team gratitude isn’t a sign of weakness or makes you “soft”. It’s nothing more than being respectful. It doesn’t have to be elaborate or expensive either. 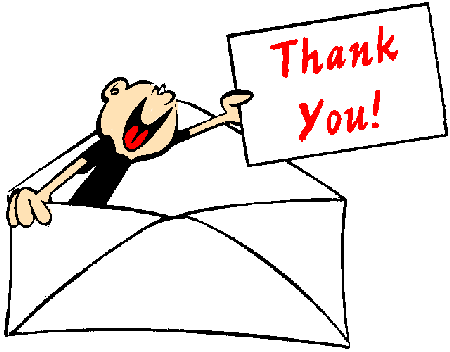 There are plenty of low to no cost sites that allow you to send free thank you cards. Here I’ll even give you one to get started http://www.123greetings.com/thank_you/at_work/. Just give a try and see what the results are. Take moment today and thank someone for all that they do for you. Remember, your company is absolutely nothing without people to create, make and buy what you are selling. You wouldn’t think twice of thanking your customers, so stop coming up with reasons to not thank your employees either.